Bora Bora diving is famous for manta rays and sharks, and on all dives you will see colorful hard and soft corals, teeming with reef fish. Diving within the waters of the most beautiful lagoon in the world is on many divers’ must do list. The unique volcanic formation of the island has left a calm, clear lagoon encircled by a string of islands and coral reef, with one pass to the royal blue Pacific Ocean. It is the quantity and diversity of marine life that is the star attraction of Bora Bora scuba diving. There are many established dive sites in Bora Bora. Bora Bora scuba diving is ideal for all levels of divers. Inside the calm lagoon is perfect for beginner divers and there are more technical dives outside the reef for advanced divers. Bora Bora's most popular dives include shark dives, manta ray dives, drift-through-the-pass dives and beginner coral garden dives. This is a small island, so it's a quick boat trip to get to almost all of Bora Bora's most popular diving spots. However, two of the best diving spots in Bora Bora are only available on a private dive or specially organized dive trip. These more distant dive locations take up to an hour to get to, but are well worth it. What can you see diving in Bora Bora? Shark dives are great in Bora Bora. French Polynesian waters are home to many species of sharks. Black tip reef sharks, lemon sharks, gray sharks, white tip sharks and hammerhead sharks can all be found in these waters. I heard someone joke that sharks outnumber the residents of French Polynesia, and it is probably true! Divers usually spot multiple shark species on the same dive, and hundreds of sharks can be seen. There are at least 16 shark species found in French Polynesia's waters. Divers have a unique opportunity to dive with graceful manta rays inside Bora Bora's lagoon. This is very special as conditions allow divers with even little experience to be able to dive with mantas at this Bora Bora diving location. Eagle rays, stingrays, bat rays and leopard rays are common residents of Bora Bora's lagoon. Witnessing them gliding along in large schools is incredible. Humpback whales migrate through these quiet waters seasonally from late July through to November, so if you are diving from August to October you can have 'close encounters' with these giants. Wondering when is the best time of year for diving? Diving in Bora Bora is good year-round. The water temperature is always warm with an average of 84°F (29°C) in summer and 79°F (26°C) degrees in winter. There is only half a degree difference between the surface water temperature and 166 feet (50 meters) down. A 1/8 inch (3mm) wetsuit or diving skins is enough protection for diving all year. The water here is very clear. Water visibility is over 100 feet(30m). One of our favorite snorkeling spots is above a dive site of 130 feet (40m) and we can see clearly all the way to the bottom to watch divers and sharks swimming along the sea bed. Sometimes we even see dolphins swimming far off in distance. Some people say it reaches over 150-200 feet (46-60m) visibility, which doesn't surprise me. Summer in Bora Bora has more rainfall than the rest of the year, but it doesn't affect the water visibility very much. Except in unusual, extreme weather conditions where it rains incessantly for several days. According to locals this only occurs once every few years! Bora Bora diving is one of the most popular activities in Bora Bora, and is easy to arrange from your resort or pension. A number of Bora Bora diving companies are actually set up at the major resorts in Bora Bora. If you are staying in a hotel or pension without a Bora Bora Diving center, the dive company you book will pick you up. 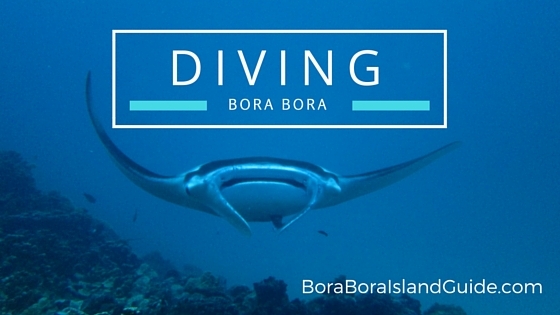 Multiple package dives are available from Bora Bora diving companies. These packages give better value than purchasing single dives. Most of the Bora Bora diving companies have locations on other islands too, so offer special rates for inter-island diving passes. Check availability and book your Bora Bora dive here. Have you dreamed of finding a black Tahitian Pearl? This unique experience is offered every afternoon by Eleuthera Diving Center. Supervised by an instructor and a professional cameraman, this romantic dive is suitable for both novices and certified divers. Take a romantic stroll under the water and find your own pearl of Polynesia to take home. If you are wanting to get diving certification while you are in Bora Bora we suggest that you undertake the PADI eLearning Open Water Diver Course before you leave for your vacation. This allows you to complete the classroom portion of the certification at home and saves your Bora Bora vacation time. If you are looking for a dive vacation in Bora Bora, there are Bora Bora cruise charter companies available. Another Tahiti diving vacation option is on Paul Gauguin cruises. The Paul Gauguin has two very respected dive masters on-board. Divers can have a dive vacation in some of the best locations in the Tahitian islands, including Bora Bora. The Gauguin's dive boat leaves straight from the sports deck marina at the the back of the cruise ship.